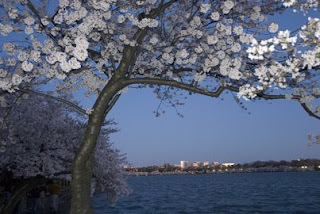 I had high hopes this year to get some decent shots of the Cherry Blossoms in Washington DC. This morning I went down and arrived at the Tidal Basin in DC about 5am. (I now know where a great parking spot is for next year). It was pretty chilly but only a handful of people were out and about. I hung out at the Jefferson Memorial while I waited for a little time to pass since the sunrise was not supposed to be until around 6. This also gave me time to actually view the memorial as I have never been there. About 5:45am I started making my way around and found a great spot (along with a few other photographers). It was still pretty windy, but was hoping it would get better as the sun started to show it's face. At about 6:10 I started to take some photographs, as the sun was starting to show some light across the basin. By 6:30am it was starting to get crowded of photographers, runner's and just people in general. About 6:45 after taking about 20-25 pictures, and finger's frozen to the bone I left. It was just too windy, too crowded and too cold to catch any real good shots. While I did not get any shots I would call great, I did get some ok shots. Overall I was disappointed with the outcome, however I will be more prepared for next year. Like the parking, I spotted a few other places that I may try out for next year's attempt.